Forest Park is one of the most prominent outdoor destinations in the city of St Louis. This city landmark is considered one of the most scenic urban parks in the world today. As it is nestled amid the bustling metropolis, the park offers a place where visitors and locals can get away from it all. The park grounds span 1,300 acres and include areas where one can enjoy a quiet picnic as well as a vigorous workout. This park was created to give St. Louisans from all walks of life a place to congregate and celebrate the civic pride of the city. Today, it is one of the top ten of the nation’s most visited public parks. Forest Park first opened in 1876. The year 1904 was perhaps the one that put this location on the map, not just in the city but the nation itself, as that year Forest Park hosted the World’s Fair. 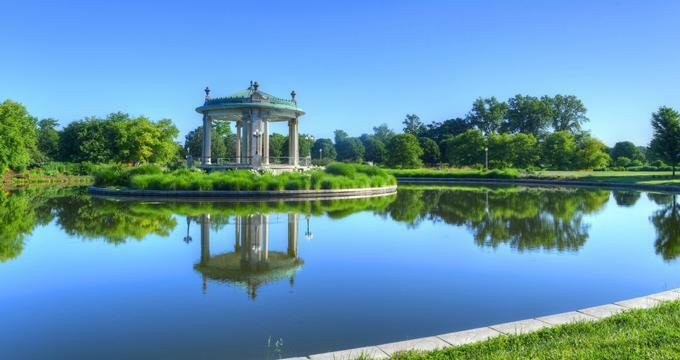 Forest Park has since expanded to included five major cultural and civic attractions: the St. Louis Science Center, St. Louis Art Museum, the St. Louis Zoo, the Missouri History Museum, and the Muny. The park also offers a lot of natural beauty by way of its 45,000 trees, numerous lakes and waterways as well as its many walking paths. From bird watching programs to wild flower exploration walks, Forest Park has much to offer those seeking a better understanding the unique ecosystems it contains. Beyond the park grounds, Forest Park is also home to the St. Louis Zoo, where visitors can further expand their understanding the natural world. Known as an affordable, family-friendly destination, the St. Louis Zoo houses many species of animals from all around the world, representing all of the major ecosystems. For nature lovers who wish to get a behind-the-scenes look at a day in the life of a zookeeper, the St. Louis Zoo offers a variety of hands-on experiences such as training, feeding, and touching some of the animal residents of the zoo. Located in the heart of Forest Park, the Muny is known across the country as the nation’s largest outdoor musical theatre. The theatre produces seven world-class shows per year and is currently in its 97th season. The Muny draws 350,000 visitors annually and prides itself on a mission based around delivering exceptional musical theatre productions that enrich the lives of locals and visitors. The summer of 2018 will mark the theatre’s 100 year anniversary, which is bound to bring jubilation to both the city of St. Louis as well as to Forest Park. Founded in an age that saw the creation of numerous artistic institutions across the Eastern Unites States, the St. Louis Art Museum was part of a movement to expand the public’s understanding of the nation’s creative landscape. Today the museum continues that mission by collecting, interpreting, and presenting works spanning six continents and five millennia. The museum comprises two buildings: the original museum structure as well as the east building, which was added in 2013. The main building offers visitors a glimpse into Forest Park’s early days, as it was constructed for the 1904 World’s Fair Exhibition. The museum’s permanent collection contains print, textile, and sculptural works. The permanent collection aims to reflect the beauty and innovation of cultures from distinct areas and time periods. With over 700 interactive exhibits, an OMNIMAX theatre, and a planetarium, the St. Louis Science Center attracts approximately one million visitors each year. One of the major draws to the institution is the breadth of material covered in its many exhibits. Ecology, physics, chemistry, biology, and astronomy are just a few of the disciplines represented in the numerous interactive exhibits at the center. Further, the center explores the relationship between science and society. The Discovery of King Tut exhibit does just that by showcasing the way in which scientific methods were applied to replicate King Tut’s tomb and the discoveries therein without compromising the original artifacts. The result is an immersive experience that few are likely to forget. The Missouri History Museum chronicles the development of the state by offering visitors an inside look at the cultural, historical, and economic forces that shaped it. Those wishing to delve deeper into the history of Forest Park and its many attractions are welcome to experience the museum’s ongoing Seeking Saint Louis exhibition.